Accent your decor with the Bruce Cinnamon Maple 3/4 in. Thick x 2-1/4 in. Wide x Random to 84 in. Length Solid Hardwood Flooring. This durable flooring features solid wood construction and a cinnamon maple finish to match many home interiors. An ideal choice for your project, this flooring requires nail-down installation and has a Janka wood hardness rating of 1450. The planks have a micro-beveled edge to suit your needs. Each sample is 5 inches in width and 7 in. in length. 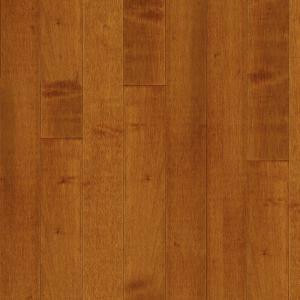 Buy online Bruce Take Home Sample - Cinnamon Maple Solid Hardwood Flooring 5 in. x 7 in. BR-700081, leave review and share Your friends.